Published on November 25, 2018. That's the pitch from Planet 13, a Las Vegas marijuana dispensary that bills itself as the world's largest. Housed in a 40,000-square-foot (3,700-square-meter) building—with retail space, back offices and room for weed cultivation—the store opened earlier this month just off the Strip in the shadow of the Palazzo, Treasure Island and the Wynn. Planet 13 embraces the gaudy showmanship that lures more than 40 million tourists to the desert each year to gamble and party. Besides the 15-foot lotus blossoms on the roof, there's a glowing 20-foot orb sitting in a fountain out front—strategically positioned for maximum visibility from thousands of hotel rooms nearby. 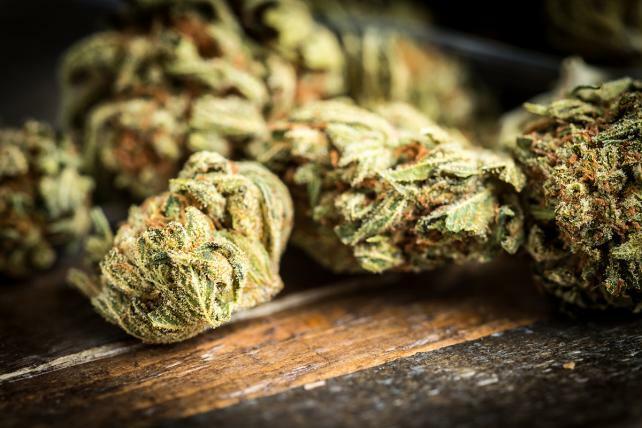 The marijuana is displayed in containers designed to look like wine goblets; customers can grab a sniff or examine the buds with magnifying glasses. Cashiers at more than 40 registers wait to ring up bags of weed—or edibles and vape pens for gamblers seeking discretion. A gram of high-grade weed sells for $20, an eighth of an ounce for about $60 and disposable vape pens cost $40. He acquired a license for a store outside the city and transferred it to Planet 13, so named because the "m" (for marijuana) is the 13th letter of the alphabet. The company parent, Planet 13 Holdings Inc., is publicly listed in Canada and has a market cap of roughly $125 million. The store, which will eventually include a coffee shop and tasting room, cost more than $8 million to build and is aimed squarely at free-spending tourists seeking an upscale experience. This being Las Vegas, the joint is open 24/7. "These are the same people who are paying $12 for a beer and don't bat an eye," Groesbeck says. "We wanted to take this out of that head-shop mindset." Weed was legalized for adult use in Nevada last year, and stores have sprouted across Las Vegas. For some tourists, dispensaries have become the first stop on the way into town from the airport. There's no marijuana for sale on the Strip itself (yet), and Planet 13 is one of the closest weed stores to the casinos and hotels. Competition is ramping up as weed growers and retailers look to cash in on Las Vegas's millions of free-spending tourists. Green Thumb Industries, whose $1.6 billion market capitalization makes it one of the nascent industry's most valuable companies, recently acquired Nevada stores and cultivation facilities in a deal valued at $290 million. That included a dispensary called Essence on South Las Vegas Boulevard, a quick cab ride from the main hotels. Smoking weed is not allowed in the casinos or technically at Las Vegas hotels. With that in mind, Groesbeck is hoping local authorities will approve a bill backing "on-premise consumption," allowing him to add a smoking lounge at Planet 13.